This guide provides procedures and examples for how to enhance your OpenShift Container Platform cluster performance and conduct scaling at different levels of an OpenShift Container Platform production stack. It includes recommended practices for building, scaling, and tuning OpenShift Container Platform clusters. Tuning considerations can vary depending on your cluster setup, and be advised that any performance recommendations in this guide might come with trade-offs. A node host will access the network to install any RPMs dependencies, such as atomic-openshift-*, iptables, and CRI-O or Docker. Pre-installing these dependencies, creates a more efficient install, because the RPMs are only accessed when necessary, instead of a number of times per host during the install. The OpenShift Container Platform install method uses Ansible. Ansible is useful for running parallel operations, meaning a fast and efficient installation. However, these can be improved upon with additional tuning options. See the Configuring Ansible section for a list of available Ansible configuration options. Parallel behavior can overwhelm a content source, such as your image registry or Red Hat Satellite server. Preparing your server’s infrastructure pods and operating system patches can help prevent this issue. Run the installer from the lowest-possible latency control node (LAN speeds). Running over a wide area network (WAN) is not advised, neither is running the installation over a lossy network connection. Ansible provides its own guidance for performance and scaling, including using RHEL 6.6 or later to ensure the version of OpenSSH supports ControlPersist, and running the installer from the same LAN as the cluster, but not running it from a machine in the cluster. 20 forks is ideal, because larger forks can lead to installations failing. Pipelining reduces the number of connections between control and target nodes, helping to improve installer performance. Network subnets can be changed post-install, but with difficulty. It is much easier to consider the network subnet size prior to installation, because underestimating the size can create problems with growing clusters. See the Network Optimization topic for recommended network subnetting practices. In addition to pod traffic, the most-used data-path in an OpenShift Container Platform infrastructure is between the OpenShift Container Platform master hosts and etcd. The OpenShift Container Platform API server (part of the master binary) consults etcd for node status, network configuration, secrets, and more. Running etcd on master hosts. By default, etcd runs in a static pod on all master hosts. Ensuring an uncongested, low latency LAN communication link between master hosts. The OpenShift Container Platform node configuration file contains important options, such as the iptables synchronization period, the Maximum Transmission Unit (MTU) of the SDN network, and the proxy-mode. To configure your nodes, modify the appropriate node configuration map. The node configuration file allows you to pass arguments to the kubelet (node) process. You can view a list of possible options by running kubelet --help. Not all kubelet options are supported by OpenShift Container Platform, and are used in the upstream Kubernetes. This means certain options are in limited support. See the Sizing Considerations section in the installation documentation for the recommended limits for an OpenShift Container Platform cluster. The recommended sizing accounts for OpenShift Container Platform and container engine coordination for container status updates. This coordination puts CPU pressure on the master and container engine processes, which can include writing a large amount of log data. etcd is a distributed key-value store that OpenShift Container Platform uses for configuration. etcd 3.x introduces important scalability and performance improvements that reduce CPU, memory, network, and disk requirements for any size cluster. etcd 3.x also implements a backwards compatible storage API that facilitates a two-step migration of the on-disk etcd database. For migration purposes, the storage mode used by etcd 3.x in OpenShift Container Platform 3.5 remained in v2 mode. As of OpenShift Container Platform 3.6, new installations use storage mode v3. Upgrades from previous versions of OpenShift Container Platform will not automatically migrate data from v2 to v3. You must use the supplied playbooks and follow the documented process to migrate the data. Version 3 of etcd implements a backwards compatible storage API that facilitates a two-step migration of the on-disk etcd database. For migration purposes, the storage mode used by etcd 3.x in OpenShift Container Platform 3.5 remained in v2 mode. As of OpenShift Container Platform 3.6, new installations use storage mode v3. As part of the process to upgrade to OpenShift Container Platform 3.7, you upgrade your etcd storage API to v3, if required. In versions 3.7 and later, you must use the v3 API. In addition to changing the storage mode for new installs to v3, OpenShift Container Platform 3.6 also begins enforcing quorum reads for all OpenShift Container Platform types. This is done to ensure that queries against etcd do not return stale data. In single-node etcd clusters, stale data is not a concern. In highly available etcd deployments typically found in production clusters, quorum reads ensure valid query results. A quorum read is linearizable in database terms - every client sees the latest updated state of the cluster, and all clients see the same sequence of reads and writes. 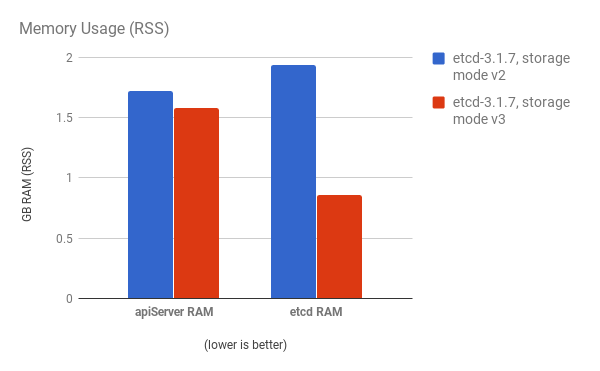 See the etcd 3.1 announcement for more information on performance improvements. It is important to note that OpenShift Container Platform uses etcd for storing additional information beyond what Kubernetes itself requires. For example, OpenShift Container Platform stores information about images, builds, and other components in etcd, as is required by features that OpenShift Container Platform adds on top of Kubernetes. 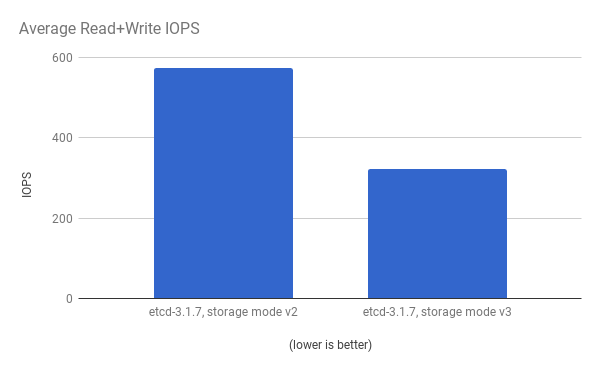 Ultimately, this means that guidance around performance and sizing for etcd hosts will differ from Kubernetes and other recommendations in salient ways. Red Hat tests etcd scalability and performance with the OpenShift Container Platform use-case and parameters in mind to generate the most accurate recommendations. Performance improvements were quantified using a 300-node OpenShift Container Platform 3.6 cluster using the cluster-loader utility. 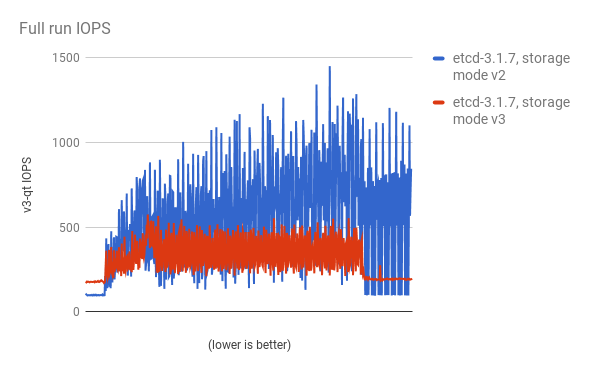 Comparing etcd 3.x (storage mode v2) versus etcd 3.x (storage mode v3), clear improvements are identified in the charts below. 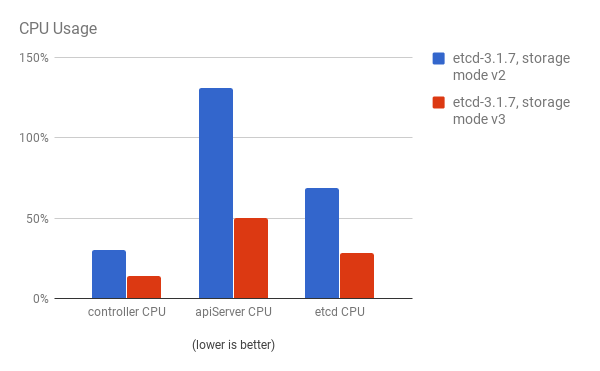 After profiling etcd under OpenShift Container Platform, etcd frequently performs small amounts of storage input and output. Using etcd with storage that handles small read/write operations quickly, such as SSD, is highly recommended. etcd processes are typically memory intensive. Master / API server processes are CPU intensive. This makes them a reasonable co-location pair within a single machine or virtual machine (VM). Optimize communication between etcd and master hosts either by co-locating them on the same host, or providing a dedicated network. To provide fast storage to an etcd node so that etcd is stable at large scale, use PCI passthrough to pass a non-volatile memory express (NVMe) device directly to the etcd node. To set this up with Red Hat OpenStack 11 or later, complete the following on the OpenStack compute nodes where the PCI device exists. Ensure Intel Vt-x is enabled in BIOS. Enable the input–output memory management unit (IOMMU). In the /etc/sysconfig/grub file, add intel_iommu=on iommu=pt to the end of the GRUB_CMDLINX_LINUX line, within the quotation marks. Restart nova-api and nova-scheduler on the controllers. Restart nova-compute on the compute nodes. Configure the OpenStack version you are running to use the NVMe and launch the etcd node. Tuned is a tuning profile delivery mechanism enabled by default in Red Hat Enterprise Linux (RHEL) and other Red Hat products. Tuned customizes Linux settings, such as sysctls, power management, and kernel command line options, to optimize the operating system for different workload performance and scalability requirements. OpenShift Container Platform leverages the tuned daemon and includes Tuned profiles called openshift, openshift-node and openshift-control-plane. These profiles safely increase some of the commonly encountered vertical scaling limits present in the kernel, and are automatically applied to your system during installation. The Tuned profiles support inheritance between profiles. They also support an auto-parent functionality which selects a parent profile based on whether the profile is used in a virtual environment. The openshift profile uses both of these features and is a parent of openshift-node and openshift-control-plane profiles. It contains tuning relevant to both OpenShift Container Platform application nodes and control plane nodes respectively. The openshift-node and openshift-control-plane profiles are set on application and control plane nodes respectively. The profile hierarchy with the openshift profile as a parent ensures the tuning delivered to the OpenShift Container Platform system is a union of throughput-performance (the default for RHEL) for bare metal hosts and virtual-guest for RHEL and atomic-guest for RHEL Atomic Host nodes. See the Red Hat Enterprise Linux Performance Tuning Guide for more information about Tuned. OpenShift Container Platform implements resource management through the compute resource model and quota system. See the documentation for more information about the OpenShift resource model. You can create a base OpenShift Container Platform image with a number of tasks built-in to improve efficiency, maintain configuration consistency on all node hosts, and reduce repetitive tasks. This is known as a pre-deployed image. For example, because every node requires the ose-pod image in order to run pods, each node has to periodically connect to the container image registry in order to pull the latest image. This can become problematic when you have 100 nodes attempting this at the same time, and can lead to resource contention on the image registry, waste of network bandwidth, and increased pod launch times. Ensure a dedicated storage device is available for CRI-O or Docker local image or container storage, separate from any persistent volumes for containers. Fully update the system, and ensure CRI-O or Docker is installed. Pre-seed your commonly used images (such as the rhel7 base image), as well as OpenShift Container Platform infrastructure container images (ose-pod, ose-deployer, etc.) into your pre-deployed image. These checks can be run either using the ansible-playbook command (the same method used during cluster installations) or as a containerized version of openshift-ansible. For the ansible-playbook method, the checks are provided by the openshift-ansible RPM package. For the containerized method, the openshift3/ose-ansible container image is distributed via the Red Hat Container Registry. Optimizing storage helps to minimize storage use across all resources. By optimizing storage, administrators help ensure that existing storage resources are working in an efficient manner. This guide primarily focuses on optimizing persistent storage. Local ephemeral storage for data utilized during the lifetime of pods has fewer options. Ephemeral storage is only available if you enabled the ephemeral storage technology preview. This feature is disabled by default. See configuring for ephemeral storage for more information. The following table lists the available persistent storage technologies for OpenShift Container Platform. Concurrency, latency, file locking mechanisms, and other capabilities vary widely between protocols, implementations, vendors, and scales. Applications must build their drivers into the application and/or container. [a] converged mode/independent mode GlusterFS, Ceph RBD, OpenStack Cinder, AWS EBS, Azure Disk, GCE persistent disk, and VMware vSphere support dynamic persistent volume (PV) provisioning natively in OpenShift Container Platform. [b] NetApp NFS supports dynamic PV provisioning when using the Trident plugin. [c] Vendor GlusterFS, Vendor S3, and Vendor Swift supportability and configurability may vary. You can use converged mode GlusterFS (a hyperconverged or cluster-hosted storage solution) or independent mode GlusterFS (an externally hosted storage solution) for block, file, and object storage for OpenShift Container Platform registry, logging, and metrics. The following table summarizes the recommended and configurable storage technologies for the given OpenShift Container Platform cluster application. [c] This does not apply to physical disk, VM physical disk, VMDK, loopback over NFS, AWS EBS, and Azure Disk. [d] For metrics, it is an anti-pattern to use any shared storage and a single volume (RWX). By default, metrics deploys with one volume per Cassandra Replica. [e] For logging, using any shared storage would be an anti-pattern. One volume per logging-es is required. [f] Object storage is not consumed through OpenShift Container Platform’s PVs/persistent volume claims (PVCs). Apps must integrate with the object storage REST API. A scaled registry is an OpenShift Container Platform registry where three or more pod replicas are running. Testing shows issues with using the RHEL NFS server as storage backend for the container image registry. This includes the OpenShift Container Registry and Quay, Cassandra for metrics storage, and ElasticSearch for logging storage. Therefore, using the RHEL NFS server to back PVs used by core services is not recommended. Other NFS implementations on the marketplace might not have these issues. Contact the individual NFS implementation vendor for more information on any testing that was possibly completed against these OpenShift core components. The preferred storage technology is object storage followed by block storage. The storage technology does not need to support RWX access mode. The storage technology must ensure read-after-write consistency. All NAS storage (excluding converged mode/independent mode GlusterFS as it uses an object storage interface) are not recommended for OpenShift Container Platform Registry cluster deployment with production workloads. While hostPath volumes are configurable for a non-scaled/HA OpenShift Container Platform Registry, they are not recommended for cluster deployment. The preferred storage technology is object storage. The storage technology must support RWX access mode and must ensure read-after-write consistency. File storage and block storage are not recommended for a scaled/HA OpenShift Container Platform registry cluster deployment with production workloads. All NAS storage (excluding converged mode/independent mode GlusterFS as it uses an object storage interface) are not recommended for OpenShift Container Platform Registry cluster deployment with production workloads. The preferred storage technology is block storage. It is not recommended to use NAS storage (excluding converged mode/independent mode GlusterFS as it uses a block storage interface from iSCSI) for a hosted metrics cluster deployment with production workloads. Testing shows issues with using the NFS server on RHEL as storage backend for the container image registry. This includes the Cassandra for metrics storage. Therefore, using NFS to back PVs used by core services is not recommended. Testing shows issues with using the NFS server on RHEL as storage backend for the container image registry. This includes ElasticSearch for logging storage. Therefore, using NFS to back PVs used by core services is not recommended. Storage technologies that support dynamic PV provisioning have low mount time latencies, and are not tied to nodes to support a healthy cluster. Application developers are responsible for knowing and understanding the storage requirements for their application, and how it works with the provided storage to ensure that issues do not occur when an application scales or interacts with the storage layer. 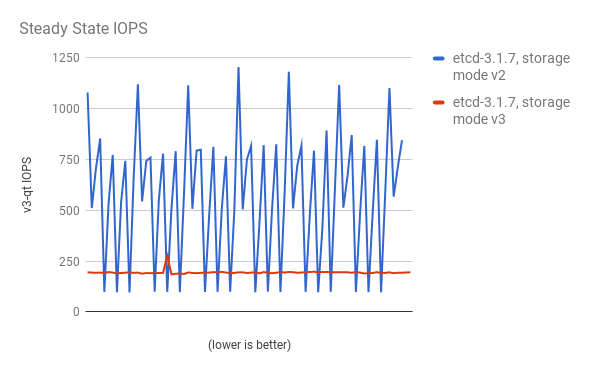 OpenShift Container Platform Internal etcd: For the best etcd reliability, the lowest consistent latency storage technology is preferable. OpenStack Cinder: OpenStack Cinder tends to be adept in ROX access mode use cases. Databases: Databases (RDBMSs, NoSQL DBs, etc.) tend to perform best with dedicated block storage. Container runtimes store images and containers in a graph driver (a pluggable storage technology), such as DeviceMapper and OverlayFS. Each has advantages and disadvantages. For more information about OverlayFS, including supportability and usage caveats, see the Red Hat Enterprise Linux (RHEL) 7 Release Notes for your version. Combines a lower (parent) and upper (child) filesystem and a working directory (on the same filesystem as the child). The lower filesystem is the base image, and when you create new containers, a new upper filesystem is created containing the deltas. Faster than Device Mapper at starting and stopping containers. The startup time difference between Device Mapper and Overlay is generally less than one second. Allows for page cache sharing. Uses LVM, Device Mapper, and the dm-thinp kernel module. It differs by removing the loopback device, talking straight to a raw partition (no filesystem). There are measurable performance advantages at moderate load and high density. It gives you per-container limits for capacity (10G by default). You have to have a dedicated partition for it. It is not set up by default in Red Hat Enterprise Linux (RHEL). All containers and images share the same pool of capacity. It cannot be resized without destroying and re-creating the pool. Uses the Device Mapper thin provisioning module (dm-thin-pool) to implement copy-on-write (CoW) snapshots. For each device mapper graph location, thin pool is created based on two block devices, one for data and one for metadata. By default, these block devices are created automatically by using loopback mounts of automatically created sparse files. It works out of the box, so it is useful for prototyping and development purposes. Not all Portable Operating System Interface for Unix (POSIX) features work (for example, O_DIRECT). Most importantly, this mode is unsupported for production workloads. For better performance, Red Hat strongly recommends using the overlayFS storage driver over Device Mapper. However, if you are already using Device Mapper in a production environment, Red Hat strongly recommends using thin provisioning for container images and container root file systems. Otherwise, always use overlayfs2 for Docker engine or overlayFS for CRI-O. devmapper: Usage of loopback devices is strongly discouraged for production use. If using CRI-O specify STORAGE_DRIVER=overlay. With CRI-O, the default overlay storage driver uses the overlay2 optimizations. Thin-provisioned volumes are not mounted and have no file system (individual containers do have an XFS file system), thus they do not show up in df output. The docker info output when using overlay2. The docker info output when using devicemapper. Corresponds to the VG you specified in /etc/sysconfig/docker-storage-setup. By default, a thin pool is configured to use 40% of the underlying block device. As you use the storage, LVM automatically extends the thin pool up to 100%. This is why the Data Space Total value does not match the full size of the underlying LVM device. This auto-extend technique was used to unify the storage approach taken in both Red Hat Enterprise Linux and Red Hat Atomic Host, which only uses a single partition. Red Hat strongly recommends using the overlay2 storage driver in thin-pool mode for production workloads. OverlayFS is also supported for container runtimes use cases as of Red Hat Enterprise Linux 7.2, and provides faster start up time and page cache sharing, which can potentially improve density by reducing overall memory utilization. The main advantage of the OverlayFS graph is Linux page cache sharing among containers that share an image on the same node. This attribute of OverlayFS leads to reduced input/output (I/O) during container startup (and, thus, faster container startup time by several hundred milliseconds), as well as reduced memory usage when similar images are running on a node. Both of these results are beneficial in many environments, especially those with the goal of optimizing for density and have high container churn rate (such as a build farm), or those that have significant overlap in image content. Page cache sharing is not possible with DeviceMapper because thin-provisioned devices are allocated on a per-container basis. DeviceMapper is the default Docker storage configuration on Red Hat Enterprise Linux. The use of OverlayFS as the container storage technology is under evaluation and moving Red Hat Enterprise Linux to OverlayFS as the default in future releases is under consideration. OverlayFS is a type of union file system. It allows you to overlay one file system on top of another. Changes are recorded in the upper file system, while the lower file system remains unmodified. This allows multiple users to share a file-system image, such as a container or a DVD-ROM, where the base image is on read-only media. OverlayFS layers two directories on a single Linux host and presents them as a single directory. These directories are called layers, and the unification process is referred to as a union mount. OverlayFS uses one of two graph drivers, overlay or overlay2. As of Red Hat Enterprise Linux 7.2, overlaybecame a supported graph driver. As of Red Hat Enterprise Linux 7.4, overlay2 became supported. SELinux on the docker daemon became supported in Red Hat Enterprise Linux 7.4. See the Red Hat Enterprise Linux release notes for information on using OverlayFS with your version of RHEL, including supportability and usage caveats. The overlay2 driver natively supports up to 128 lower OverlayFS layers but, the overlay driver works only with a single lower OverlayFS layer. Because of this capability, the overlay2 driver provides better performance for layer-related Docker commands, such as docker build, and consumes fewer inodes on the backing filesystem. Because the overlay driver works with a single lower OverlayFS layer, you cannot implement multi-layered images as multiple OverlayFS layers. Instead, each image layer is implemented as its own directory under /var/lib/docker/overlay. Hard links are then used as a space-efficient way to reference data shared with lower layers. Docker recommends using the overlay2 driver with OverlayFS rather than the overlay driver, because it is more efficient in terms of inode utilization. This topic applies only if you enabled the ephemeral storage technology preview. This feature is disabled by default. To enable this feature, see configuring for ephemeral storage. Technology Preview releases are not supported with Red Hat production service-level agreements (SLAs) and might not be functionally complete, and Red Hat does not recommend using them for production. These features provide early access to upcoming product features, enabling customers to test functionality and provide feedback during the development process. For more information see Red Hat Technology Preview Features Support Scope. Pods use ephemeral storage for their internal operation such as saving temporary files. The lifetime of this ephemeral storage does not extend beyond the life of the individual pod, and this ephemeral storage cannot be shared across pods. Pods do not know how much local storage is available to them. Pods cannot request guaranteed local storage. Local storage is a best effort resource. Pods can get evicted due to other pods filling the local storage, after which, new pods are not admitted until sufficient storage has been reclaimed. Ephemeral storage is still exposed to pods in the same way, but there are new methods for implementing requests and limits on pods' consumption of ephemeral storage. Management of container logs applies only if using CRI-O as the container runtime and file-based logging for logging. It is important to understand that ephemeral storage is shared among all pods in the system, and that OpenShift Container Platform does not provide any mechanism for guaranteeing any level of service beyond the requests and limits established by the administrator and users. For example, ephemeral storage does not provide any guarantees of throughput, I/O operations per second, or any other measure of storage performance. A node’s local storage can be broken into primary and secondary partitions. Primary partitions are the only ones you can use for ephemeral local storage. There are two supported primary partitions, root and runtime. Root partitions hold the kubelet’s root directory, /var/lib/kubelet/ by default, and /var/log/ directory. You can share this partition among pods, the operating system, and OpenShift Container Platform system daemons. Pods can access this partition by using EmptyDir volumes, container logs, image layers, and container writable layers. OpenShift Container Platform manages shared access and isolation of this partition. Runtime partitions are optional partitions you can use for overlay file systems. OpenShift Container Platform attempts to identify and provide shared access along with isolation to this partition. This partition contains container image layers and writable layers. If the runtime partition exists, the root partition does not hold any image layer or writable layers. The OpenShift SDN uses OpenvSwitch, virtual extensible LAN (VXLAN) tunnels, OpenFlow rules, and iptables. This network can be tuned by using jumbo frames, network interface cards (NIC) offloads, multi-queue, and ethtool settings. VXLAN provides benefits over VLANs, such as an increase in networks from 4096 to over 16 million, and layer 2 connectivity across physical networks. This allows for all pods behind a service to communicate with each other, even if they are running on different systems. VXLAN encapsulates all tunneled traffic in user datagram protocol (UDP) packets. However, this leads to increased CPU utilization. Both these outer- and inner-packets are subject to normal checksumming rules to guarantee data has not been corrupted during transit. Depending on CPU performance, this additional processing overhead can cause a reduction in throughput and increased latency when compared to traditional, non-overlay networks. Cloud, VM, and bare metal CPU performance can be capable of handling much more than one Gbps network throughput. When using higher bandwidth links such as 10 or 40 Gbps, reduced performance can occur. This is a known issue in VXLAN-based environments and is not specific to containers or OpenShift Container Platform. Any network that relies on VXLAN tunnels will perform similarly because of the VXLAN implementation. Use Native Container Routing. This option has important operational caveats that do not exist when using OpenShift SDN, such as updating routing tables on a router. Evaluate network plug-ins that implement different routing techniques, such as border gateway protocol (BGP). Use VXLAN-offload capable network adapters. VXLAN-offload moves the packet checksum calculation and associated CPU overhead off of the system CPU and onto dedicated hardware on the network adapter. This frees up CPU cycles for use by pods and applications, and allows users to utilize the full bandwidth of their network infrastructure. VXLAN-offload does not reduce latency. However, CPU utilization is reduced even in latency tests. There are two important maximum transmission units (MTUs): the network interface card (NIC) MTU and the SDN overlay’s MTU. The NIC MTU must be less than or equal to the maximum supported value of the NIC of your network. If you are optimizing for throughput, pick the largest possible value. If you are optimizing for lowest latency, pick a lower value. The SDN overlay’s MTU must be less than the NIC MTU by 50 bytes at a minimum. This accounts for the SDN overlay header. So, on a normal ethernet network, set this to 1450. On a jumbo frame ethernet network, set this to 8950. This 50 byte overlay header is relevant to the OpenShift SDN. Other SDN solutions might require the value to be more or less. Maximum transmission unit (MTU) for the pod overlay network. Set to redhat/openshift-ovs-subnet for the ovs-subnet plug-in, redhat/openshift-ovs-multitenant for the ovs-multitenant plug-in, or redhat/openshift-ovs-networkpolicy for the ovs-networkpolicy plug-in. This can also be set to any other CNI-compatible plug-in as well. You must change the MTU size on all masters and nodes that are part of the OpenShift Container Platform SDN. Also, the MTU size of the tun0 interface must be the same across all nodes that are part of the cluster. Under most circumstances, these networks cannot be changed after deployment. So, planning ahead for growth is important. Restrictions for resizing networks are document in the Configuring SDN documentation. This will allow for 8192 nodes, each with 510 usable IP addresses. See the supportability limits in the OpenShift Container Platform documentation for node/pod limits for the version of software you are installing. Because encrypting and decrypting node hosts uses CPU power, performance is affected both in throughput and CPU usage on the nodes when encryption is enabled, regardless of the IP security system being used. IPSec encrypts traffic at the IP payload level, before it hits the NIC, protecting fields that would otherwise be used for NIC offloading. This means that some NIC acceleration features may not be usable when IPSec is enabled and will lead to decreased throughput and increased CPU usage. The OpenShift Container Platform router is the ingress point for all external traffic destined for OpenShift Container Platform services. One of the most important tunable parameters for HAProxy scalability is the maxconn parameter, which sets the maximum per-process number of concurrent connections to a given number. Adjust this parameter by editing the ROUTER_MAX_CONNECTIONS environment variable in the OpenShift Container Platform HAProxy router’s deployment configuration file. In OpenShift Container Platform, the HAProxy router runs as a single process. The OpenShift Container Platform HAProxy router typically performs better on a system with fewer but high frequency cores, rather than on an symmetric multiprocessing (SMP) system with a high number of lower frequency cores. The HAProxy router comes with support for multithreading in OpenShift Container Platform. On a multiple CPU core system, increasing the number of threads can help the performance, especially when terminating SSL on the router. The OpenShift Container Platform HAProxy router request buffer configuration limits the size of headers in incoming requests and responses from applications. The HAProxy parameter tune.bufsize can be increased to allow processing of larger headers and to allow applications with very large cookies to work, such as those accepted by load balancers provided by many public cloud providers. However, this affects the total memory use, especially when large numbers of connections are open. With very large numbers of open connections, the memory usage will be nearly proportionate to the increase of this tunable parameter. OpenShift Container Platform exposes metrics that can be collected and stored in back-ends by the cluster-monitoring-operator. As an OpenShift Container Platform administrator, you can view system resources, containers and components metrics in one dashboard interface, Grafana. This topic provides information on scaling the cluster monitoring operator. Use at least three infrastructure (infra) nodes. Use at least three openshift-container-storage nodes with non-volatile memory express (NVMe) drives. Use persistent storage when configuring openshift-monitoring. Set openshift_cluster_monitoring_operator_prometheus_storage_enabled=true. Use GlusterFS as storage on top of NVMe drives. Various tests were performed for different scale sizes. The Prometheus database grew, as reflected in the table below. In the above calculation, approximately 20 percent of the expected size was added as overhead to ensure that the storage requirements do not exceed the calculated value. The above calculation was developed for the default OpenShift Container Platform cluster-monitoring-operator. For higher scale, edit the openshift_cluster_monitoring_operator_prometheus_storage_capacity variable in the Ansible inventory file, which defaults to 50Gi. CPU utilization has minor impact. The ratio is approximately 1 core out of 40 per 50 nodes and 1800 pods. Infra nodes (VMs) - 40 cores, 157 GB RAM. CNS nodes (VMs) - 16 cores, 62 GB RAM, NVMe drives. Based on you scale destination, compute and set the relevant PV size for the Prometheus data store. Since the default Prometheus pods replicas is 2, for 100 nodes with 3600 pods you will need 188 GB. Based on this equation, set openshift_cluster_monitoring_operator_prometheus_storage_capacity=94Gi. The default replicas are 2 Prometheus pods. If you add a new node to or remove an existing node from a Prometheus cluster, the data stored in the cluster rebalances across the cluster. Consider the following object limits when you plan your OpenShift Container Platform cluster. These limits are based on the largest possible cluster. For smaller clusters, the limits are proportionally lower. There are many factors that influence the stated thresholds, including the etcd version or storage data format. In most cases, exceeding these limits results in lower overall performance. It does not necessarily mean that the cluster will fail. 10 is the default value. The maximum supported value is the number of pods per node. There is no default value. The maximum supported value is the number of pods per node. [a] Clusters with more than the stated limit are not supported. Consider splitting into multiple clusters. [b] The pod count displayed here is the number of test pods. The actual number of pods depends on the application’s memory, CPU, and storage requirements. [c] There are a number of control loops in the system that need to iterate over all objects in a given namespace as a reaction to some changes in state. Having a large number of objects of a given type in a single namespace can make those loops expensive and slow down processing given state changes. The limit assumes that the system has enough CPU, memory, and disk to satisfy the application requirements. [d] Each service port and each service back-end has a corresponding entry in iptables. The number of back-ends of a given service impact the size of the endpoints objects, which impacts the size of data that is being sent all over the system. Some of the limits are stretched only in a single dimension, so they might vary when a lot of objects are running on the cluster. The number of pods expected to fit on a node is dependent on the application itself. Consider the application’s memory, CPU, and storage requirements. Extrapolated requirements: 550 CPU cores, 450GB RAM, and 1.4TB storage. Instance size for nodes can be modulated up or down, depending on your preference. Nodes are often resource overcommitted. In this deployment scenario, you can choose to run additional smaller nodes or fewer larger nodes to provide the same amount of resources. Factors such as operational agility and cost-per-instance should be considered. Some applications lend themselves well to overcommitted environments, and some do not. Most Java applications and applications that use huge pages are examples of applications that would not allow for overcommitment. That memory can not be used for other applications. In the example above, the environment would be roughly 30 percent overcommitted, a common ratio. Cluster Loader is a tool that deploys large numbers of various objects to a cluster, which creates user-defined cluster objects. Build, configure, and run Cluster Loader to measure performance metrics of your OpenShift Container Platform deployment at various cluster states. After installation, the test executable extended.test is located in /usr/libexec/atomic-openshift/extended.test. In this example, there is a subdirectory called config/ with a configuration file called test.yml. In the command line, exclude the extension of the configuration file, as the tool will automatically determine the file type and extension. Create multiple namespaces (projects), which contain multiple templates or pods. Locate the configuration files for Cluster Loader in the config/ subdirectory. The pod files and template files referenced in these configuration examples are found in the content/ subdirectory. Set to true or false. One definition per configuration. If set to true, cleanup will delete all namespaces (projects) created by Cluster Loader at the end of the test. A sub-object with one or many definition(s). Under projects, each namespace to create is defined and projects has several mandatory subheadings. A sub-object with one definition per configuration. tuningset allows the user to define a tuning set to add configurable timing to project or object creation (pods, templates, and so on). An optional sub-object with one definition per configuration. Adds synchronization possibilities during object creation. An integer. One definition of the count of how many projects to create. A string. One definition of the base name for the project. The count of identical namespaces will be appended to Basename to prevent collisions. A string. One definition of what tuning set you want to apply to the objects, which you deploy inside this namespace. A string containing either reuse or delete. Defines what the tool does if it finds a project or namespace that has the same name of the project or namespace it creates during execution. A list of key-value pairs. The key is the ConfigMap name and the value is a path to a file from which you create the ConfigMap. A list of key-value pairs. The key is the secret name and the value is a path to a file from which you create the secret. A sub-object with one or many definition(s) of pods to deploy. A sub-object with one or many definition(s) of templates to deploy. An integer. The number of pods or templates to deploy. A string. The container image URL to a repository where it can be pulled. A string. One definition of the base name for the template (or pod) that you want to create. A string. The path to a local file, which is either a PodSpec or template to be created. Key-value pairs. Under parameters, you can specify a list of values to override in the pod or template. A string. The name of the tuning set which will match the name specified when defining a tuning in a project. A sub-object identifying the tuningset that will apply to pods. A sub-object identifying the tuningset that will apply to templates. A sub-object. A stepping configuration used if you want to create an object in a step creation pattern. A sub-object. A rate-limiting tuning set configuration to limit the object creation rate. An integer. How many objects to create before pausing object creation. An integer. How many seconds to pause after creating the number of objects defined in stepsize. An integer. How many seconds to wait before failure if the object creation is not successful. An integer. How many milliseconds (ms) to wait between creation requests. A sub-object with enabled and port fields. The boolean enabled defines whether to start a HTTP server for pod synchronization. The integer port defines the HTTP server port to listen on (9090 by default). A boolean. Wait for pods with labels matching selectors to go into Running state. A boolean. Wait for pods with labels matching selectors to go into Completed state. A list of selectors to match pods in Running or Completed states. A string. The synchronization timeout period to wait for pods in Running or Completed states. For values that are not 0, use units: [ns|us|ms|s|m|h]. Optional setting for end-to-end tests. Set to local to avoid extra log messages. The tuning sets allow rate limiting and stepping, the ability to create several batches of pods while pausing in between sets. Cluster Loader monitors completion of the previous step before continuing. Stepping will pause for M seconds after each N objects are created. Rate limiting will wait M milliseconds between the creation of objects. If you deploy pods, adding the parameter is unnecessary. CPU Manager manages groups of CPUs and constrains workloads to specific CPUs. Require as much CPU time as possible. Are sensitive to processor cache misses. Coordinate with other processes and benefit from sharing a single processor cache. kube-reserved is a required setting. The value may need to be adjusted depending on your environment. Pods of QoS tier Guaranteed are placed within the kubepods.slice. Pods of other QoS tiers end up in child cgroups of kubepods. This VM has four CPU cores. You set kube-reserved to 500 millicores, meaning half of one core is subtracted from the total capacity of the node to arrive at the Node Allocatable amount. You can see that Allocatable CPU is 3500 millicores. This means we can run three of our CPU manager pods since each will take one whole core. A whole core is equivalent to 1000 millicores. Memory is managed in blocks known as pages. On most systems, a page is 4Ki. 1Mi of memory is equal to 256 pages; 1Gi of memory is 262,144 pages, and so on. CPUs have a built-in memory management unit that manages a list of these pages in hardware. The Translation Lookaside Buffer (TLB) is a small hardware cache of virtual-to-physical page mappings. If the virtual address passed in a hardware instruction can be found in the TLB, the mapping can be determined quickly. If not, a TLB miss occurs, and the system falls back to slower, software-based address translation, resulting in performance issues. Since the size of the TLB is fixed, the only way to reduce the chance of a TLB miss is to increase the page size. A huge page is a memory page that is larger than 4Ki. On x86_64 architectures, there are two common huge page sizes: 2Mi and 1Gi. Sizes vary on other architectures. In order to use huge pages, code must be written so that applications are aware of them. Transparent Huge Pages (THP) attempt to automate the management of huge pages without application knowledge, but they have limitations. In particular, they are limited to 2Mi page sizes. THP can lead to performance degradation on nodes with high memory utilization or fragmentation due to defragmenting efforts of THP, which can lock memory pages. For this reason, some applications may be designed to (or recommend) usage of pre-allocated huge pages instead of THP. In OpenShift Container Platform, applications in a pod can allocate and consume pre-allocated huge pages. This topic describes how. Nodes must pre-allocate huge pages in order for the node to report its huge page capacity. A node can only pre-allocate huge pages for a single size. Huge pages can be consumed via container level resource requirements using the resource name hugepages-<size>, where size is the most compact binary notation using integer values supported on a particular node. For example, if a node supports 2048KiB page sizes, it will expose a schedulable resource hugepages-2Mi. Unlike CPU or memory, huge pages do not support overcommitment. Specify the amount of memory for hugepages as the exact amount to be allocated. Do not specify this value as the amount of memory for hugepages multiplied by the size of the page. For example, given a huge page size of 2MB, if you want to use 100MB of huge-page-backed RAM for your application, then you would allocate 50 huge pages. OpenShift Container Platform handles the math for you. As in the above example, you can specify 100MB directly. Some platforms support multiple huge page sizes. To allocate huge pages of a specific size, precede the huge pages boot command parameters with a huge page size selection parameter hugepagesz=<size>. The <size> value must be specified in bytes with an optional scale suffix [kKmMgG]. The default huge page size can be defined with the default_hugepagesz=<size> boot parameter. See Configuring Transparent Huge Pages for more information. Huge page requests must equal the limits. This is the default if limits are specified, but requests are not. Huge pages are isolated at a pod scope. Container isolation is planned in a future iteration. EmptyDir volumes backed by huge pages must not consume more huge page memory than the pod request. Applications that consume huge pages via shmget() with SHM_HUGETLB must run with a supplemental group that matches proc/sys/vm/hugetlb_shm_group.